Ready to take a quick break and learn a new Power BI trick? We've got you covered! Announcing the latest community resource, the Power BI Video Gallery. The Video Gallery is a place for community rockstars like you to share your knowledge and provide tips and tricks for all things related to Power BI, including data analysis and modelling, custom visual development, using DAX, and more. Most videos in the Gallery are designed to be short and easy to watch at work or while on the go on your mobile device. All Video Gallery submissions are by active members who have been recognized for their understanding of Power BI and helpfulness within the community. If you'd like to become an approved submitter, send me (@Jessica) a private message through the community with a YouTube link demonstrating one of your favorite Power BI tricks. We're celebrating the launch of the Video Gallery with our first Ask a Partner Anything Event, featuring Critical Path CEO and video instructor Ted Pattison. 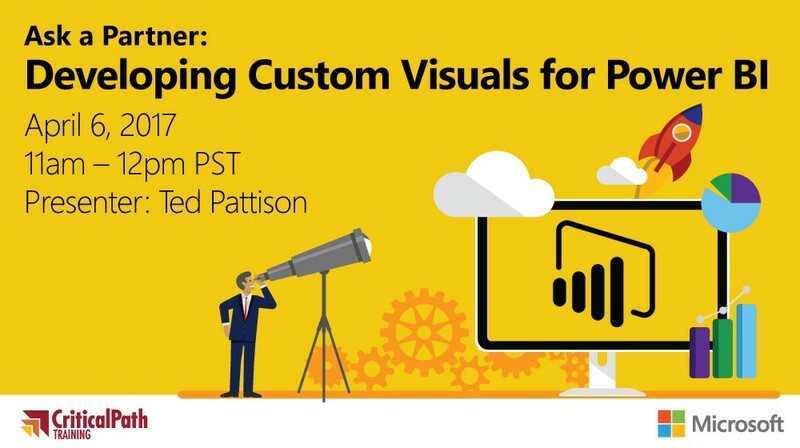 Ted has authored an hour-long video on Developing Custom Visuals for Power BI, now available in the Video Gallery. Watch the video this week, and then join Ted in the community on Thursday, April 6, 2017 from 11 a.m. to 12 p.m. PT, for a live Q&A event! This is your opportunity to ask questions and share feedback directly with Ted and learn from his extensive history with custom visual development, Power BI, and training. You can bookmark the Q&A forum now, and Kudo Ted’s video for a chance to win an official Power BI t-shirt. We hope you enjoy the new Video Gallery, and look forward to seeing you on April 6 at the Ask a Partner Anything Event!